Have you ever seen a scarecrow? (You might show pictures.) Farmers use them in their fields. Do you know why? To scare away crows and other kinds of birds that eat their crops. Wouldn't it be great if we could use scarecrows to scare away frightening things in our lives? What are some things that scare you? (Allow for discussion). Let's pray and ask Jesus to help us trust him to protect us (Pray specifically about the scary things mentioned during your discussion time. Thank God for his promise to protect us and never leave us.). Today we will make a Scarecrow Lollipop to remind us that God will protect us and never leave us, and because of this, life doesn't have to be scary! What You Need: Tootsie pops or round lollipop (do not remove paper); thin burlap fabric or cloth (4"-5" square) enough to fit around the lollipop; rubber band; 2"-3" round piece of green felt or fabric; orange and black yarn; strip of paper with Psalm 118:6 written on it or print the tract card; hole punch; permanent black marker; tacky glue or hot glue. Directions: Place fabric over lollipop. Wrap a rubber band around the "neck" of the scarecrow to hold in place. Draw the eyes, nose and mouth using the black marker. Tie orange and black yarn around the neck of the scarecrow. Glue the round piece of green felt to the top of the lollipop to form the hat* (you can dip the top of the lollipop into the glue or hot glue a ring of glue around the lollipop to cover the sides, back and brow of the face). Punch a hole in the strip of paper. Tie the Bible verse to the neck of the scarecrow using another piece of yarn or attach the Scarecrow Lollipop to the Halloween tract, link below. Print our Halloween tract cards! 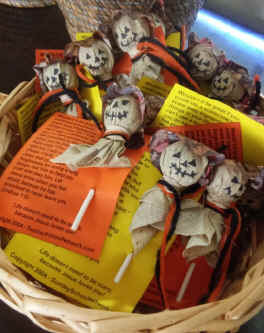 Place a Scarecrow Lollipop in the tract card, and then hand it out during your Fall Festival or to Trick-or-Treaters in your neighborhood. *Alternate hat: use miniature straw hats or petite-four papers. Sent in by Betty from VA.
You may print this page and distribute it. Please do not remove the copyright and website notice.